When they travel around the world for golfing tournaments, the Watson family clamors for the beach. The two-time Masters champion takes his entire life on the road—including his wife and two kids—when he hits tournaments, creating a different sort of downtime for him than he had in his early days. That means beaches aplenty for Bubba. But the travel doesn’t end at the sand and surf. “It is all about the surroundings you are in,” Watson says. “If you just worry about golf the whole time it would be stressful. You think about your bad rounds, think about good rounds." So Watson takes what a tournament’s location gives him. If there's a local beach, he's there. If he's playing a few rounds at a tournament in the mountains, he’s all about fishing or riding horses. In Los Angeles? Watson is quick to take in some basketball at the Staples Center. “I love watching the NBA,” says Watson. As time has passed, the types of tournaments Watson chooses to play in have also changed. In his rookie year, he would take on any course that was set up to his liking; now, he picks the best options for his game and his family. Watson says having kids cuts out one or two tournaments a year. And with the family coming to 80% of his trips, Watson has plenty to occupy himself with off the course. His workouts—inside the house or hotel—include cardio with a jump rope and a lot of band work. 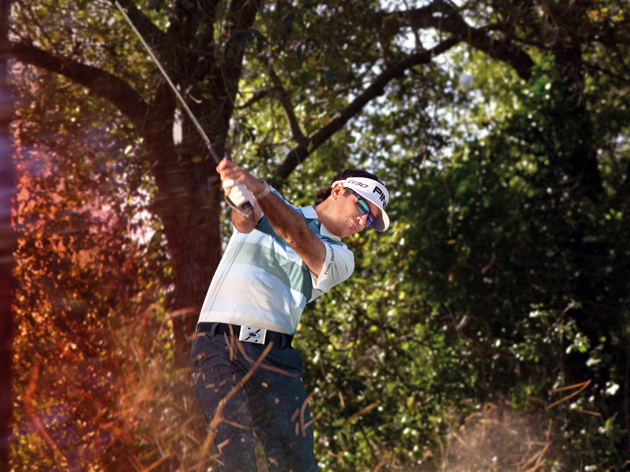 When it comes time for competition, Watson's bag is 100% in his control, as he decides every club, every gadget. “Those are my other babies,” he says about his Ping clubs. While saying that not every pro does it, Watson always brings a lightweight Oakley rain suit and an umbrella. He has extra gloves in case one rips and he brings rain gloves too. Watson uses athletic tape for his fingers in case of a cut or blister. A couple of things he’ll never run out of though: Bubba Watson golf tees and ball markers. “I was bored one day during the winter and I searched the Internet and found a company that makes game tokens,” he says about his custom-made ball markers. So he had them made a couple of years ago. Each copper piece is about the size of a quarter with “Bubba” on the front and back circled in stars. So, together they come up with the four-day plans, with Oakley getting 51% of the final say on the outfits. Apart from his golf outfits, Watson always brings plenty of workout gear and “lay-around clothes,” such as Oakley shorts, sweats and long-sleeve t-shirts. Watson has proven fairly cool at the Masters, ball markers and all.